Pablum Baby Cereal 1953 Ad. 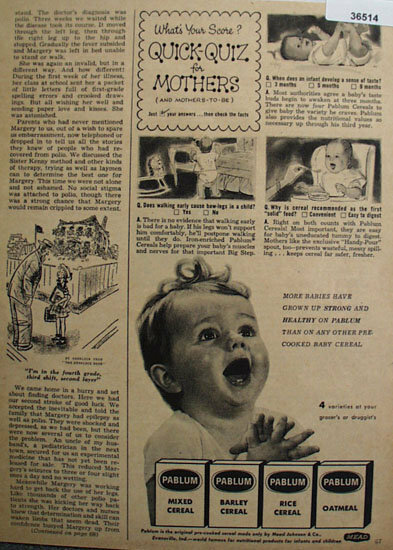 This black and white January, 1953 ad states More Babies have grown up strong and healthy on Pablum than on any other pre-cooked Baby Cereal. Whats your Score, Quick Quiz for Mothers with three questions and answers. Picture shows baby with hands crossed and mouth open. Magazine tear sheet picture is taken through plastic and may show wrinkles or crookedness that is not in the ad. This Original magazine tear sheet measures 8inches wide by 10 3/4 inches tall. Items Similar To "Pablum Baby Cereal 1953 Ad."